Our community association accepted the invitation by Alderman Hopkins to meet him and Sterling Bay's top partners and their architect, SOM, on Monday January 21, 2019 to review the revised Master Plan for Lincoln Yards. As we have been engaged in a largely constructive dialogue with Sterling Bay to communicate our neighborhood's concerns and priorities, we accepted this invitation to further allow SNA to continue outlining our neighborhood’s thoughts about their latest proposal. These thoughts and concerns were largely compiled from prior SNA survey's, including one we released this weekend, requesting our communal feedback. If you have not had a chance to complete the poll please do here. We used as many of the questions from the poll we received before Monday's meeting so thank you for that quick feedback. During our meeting we were able to review the entirety of the Master Plan and engage in a robust, nearly three-and-a-half hour discussion reviewing this document. Importantly, while SNA made the statement that we are not ready to fully support this project, we are certainly more informed about the details of the project scope and sequencing and we are excited about the new design elements and the specific vision of the programming including mixed-use, retail, office, residential and more open and contiguous active park space. As our survey had informed us, one of (if not the) primary concern of SNA residents is the ability to mitigate traffic congestion in our neighborhood. While substantial amounts of traffic can rightfully be attributed to "legacy" issues due to overall lack of City investment in our local infrastructure over the past several decades, the fact remains we need a clear, realistic outline of solutions to current and future traffic conditions and how they will be managed prior to supporting any development on this site. We were encouraged to hear all at the table agreeing with our assessment. Sterling Bay further explained they will be able to provide a path to that goal shortly as they and Alderman Hopkins stated there is a traffic impact study providing this realistic path forward. We are awaiting the reports. Alderman Hopkins further informed us he has reviewed the impact study and he Is optimistic about the highlights of the report we look forward to seeing soon. He stated the improved infrastructure being planned and the current proposal would move the bridge and road capacity from being over capacity to being under capacity. We hope this to be true and verifiable. The study is a comprehensive, nearly 800 page document that is currently being analyzed by a Sheffield resident and DePaul professor who is preparing an executive summary of the findings. However, once again, those details will provide further confirmation of this assertion. Since the last public meeting in late November, Lincoln Yards "North" remains unchanged with the main revisions being on Lincoln Yards "South", including the well publicized removal of the proposed soccer stadium and subsequent dissolution of the proposed "entertainment district." In both instances, these revisions represent design improvements, which were strongly advocated by SNA in prior discussions with Sterling Bay spanning these past several months. In short, it was our primary demand in our negotiations. Remove the stadium and figure out the Live Nation partnership. In place of the stadium and music district, modifications to Dominick Street (south of the River) were made to "straighten" the street from prior iterations along with additional office and residential structures averaging roughly 12 stories in height. However, the bulk of the former stadium location will now contain substantial increases in open space, which are now more contiguous to provide more recreational programming. As SNA has strongly advocated for additional park space to be included within the proposal, we are encouraged Sterling Bay listened to our concerns by reconfiguring substantial portions of land formerly containing the stadium with almost 3 additional acres of park space. This additional allocation of park space brings the total park space allocation to over 11 acres (over 52%) out of a total 21 acres of open space contained on site. As you know, significant community concern arose by the proposed heights and density contained in the proposal. While some reductions in height and density have occurred over the evolution of the proposal, and we did reiterate our communities concerns on these matters, the fact remains the proposed heights are all being guided by the North Branch Framework which was negotiated last year and approved by the City Council. The battle to reduce further the heights of the buildings will continue however the main battle ended when the City Council approved the Framework plan last year. That set the stage for building heights and density. In order to receive more concessions on density or building height, we would need to reduce the amount of open space in the master plan. There needs to be a balance between the two. 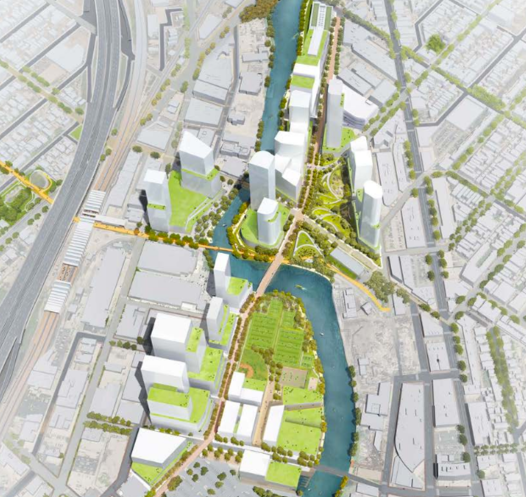 As the Framework calls for increased height and density located within the specific location of the former North Branch Industrial Corridor, in return for substantial improvements to infrastructure and open space allocations, what is proposed at Lincoln Yards is what is allowable under the Framework plan. One final detail is our desire to review the Planned Development documents as soon as possible and that until we review those final documents (the actual details of the proposal) we could not give our support for this project. The devil so to speak will be in the details and we need to review them and will give Sterling Bay and Alderman Hopkins input when they are available. That should be very soon we are told. All in all, we challenged Sterling Bay to continue to improve their proposal for the benefit of our community, and we requested Alderman Hopkins continue to negotiate on our behalf by compiling a full listing of community benefits this PD will provide our community. We strongly encouraged Alderman Hopkins to consider hosting another community meeting and to remove this proposal from the Plan Commission agenda on Thursday. He stated while he appreciated the suggestion, he has moved from being an alderman reviewing the proposed development plans to one who will now work on getting the proposal approved. He believes strongly this proposal is ready for full council review and he believes he as the votes to get it approved. SNA will continue to work on our communities behalf to have further information made available regarding specific elements to be contained within the PD as well as the proposed transit and traffic improvements associated with it. We will continue to update you on the proposal as news becomes available.